To get really deep rich flavor in a chili it’s best to let is slowly simmer for a few hours until all the different elements have merged and blended into a harmonious and integrated pot of deliciousness. But sometimes you don’t have that kind of time. Or sometimes you might want something chili-like but a little fresher tasting. And that’s when it’s time for a quick chili. The last couple of weeks I’ve been digging through my freezer to pull out anything that’s been in there for a while. Over the weekend I found a large package of turkey. Sunday morning I made a big pot of turkey and barley soup and later in the day I pulled together a quick chili. 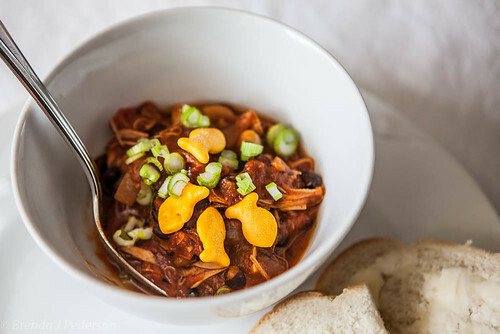 I like to make turkey chili with lighter, fresher-tasting ingredients than I do a beef chili. This makes it really easy to pull together in a shorter time. Below is a rough recipe. As always, feel free to experiment and modify for your own taste – especially important when deciding how much heat to add to something like chili! Sometimes I add carrots and celery, along with the onions, for a little sweetness and crunch. Some people like bell pepper chunks in their chili. I’d been thinking of adding some frozen corn at the same time I added the roasted turkey and forgot to – but it’s good either way. The recipe is below the jump. Add a little olive oil to a large pot and place over medium-high heat. Add the onion and garlic and saute until translucent and soft. If using ground turkey add it to the pan, stirring and breaking it up until cooked all the way through. If using roasted turkey, add it near the end. Add the bay leaves, chipotle powder and dried chilis. Stir to combine. Add the tomatoes and beans. Bring to a boil and then cover and simmer for about 30 minutes. If using the roasted turkey pieces, add them now. Cook for an additional 15 to 30 minutes. Divide between individual bowls. If desired, garnish with your favorite toppings such as sour cream, green onions, grated cheese or crackers for a little crunch. I like to use a combination of tomato types to make the sauce thick but also have texture. In this batch I used 1 can of diced tomatoes, 1 can of whole tomatoes (that I broke up while cooking) and 1 can of sauce. For the beans you can use any combination of canned beans you’d like. Think about navy beans, pork’n’beans, cannellini beans, black beans, kidney beans, garbanzos… For this chili I used one can of black beans and one can of cannellini – mostly because I had them on hand. Chicken works well in this recipe, too. This looks good! I’m excited to give a try maybe this Friday for dinner for my husband and me.